The recipient of this year’s Unsung Hero Award is Pastor Randy Booth. 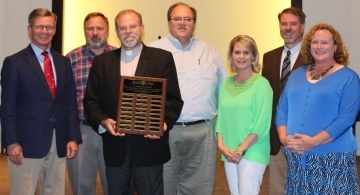 Chosen by the board for this honor, Pastor Booth served as the school’s first board chairman and has continued to serve the school selflessly ever since. Thank you, and God bless you, Pastor Booth! Pictured below is Pastor Booth with the Regents school board and headmaster. Left to right: David Alders, John Henry, Randy Booth, Mark Sowell, Gigi Hebert, David Bryant, Kelly Young. In 2001 a group of families got together and decided to open a school. They knew they wanted something better for their children and their community. They knew they wanted a school that passed on to their children a Christian worldview and created children that could think. These families wanted a school that teaches children how to learn and children that could be lights in a dark world. So this group of families began meeting in someone’s house with moms filling the role of teacher. Slowly the group began learning what worked and what did not. Strong-willed people had to learn to work together to make this happen. They used borrowed facilities, bought supplies at auctions and crammed into spaces that were too small, all in hopes that someday there would be a school they could pass on to their community. This group grew. They added families much smarter and better looking than their own and steadily they have seen the school develop into what you see today. God has blessed us with 12,000 square feet, 115 students, a soccer field, classrooms, playgrounds– and with you teachers. This year’s teaching staff is the best collection of minds and hearts that this school has ever seen. The board could not be more excited about each and every teacher on our staff this year! We have gotten to know each of you over the years through classroom interactions, interviews and from afar through your students. The board wants you to know that we see you as brothers and sisters in Christ working shoulder to shoulder with us in an effort to make a lasting change in our culture. Please know that the board and administration are here for you and we want to empower you to share your love of God, your love of learning, and your love for each student every day. Additionally, the board wants you to continue to grow in your knowledge of what we are trying to do here at Regents Academy. I’m talking about a better understanding of what it means to be classical, what it means to be Christian, and understanding how we are helping families to name a few. I know you are busy, but please participate in the bigger picture of what is going on here as well. As I asked our parents at orientation, read the Nightstand Articles, attend the board meetings, and communicate with us. We know that teaching at Regents Academy can be a challenge, and we know that teaching at Regents Academy requires a huge sacrifice from each of you. The board wants you to know that we are doing our best to support you and keep the mission of our school as we continue to grow and learn. I was taught that when someone gives you a gift or does something special for you that I should say thank you. On behalf of the board…Thank you for all you do for Regents Academy and on behalf of the Sowell family…Thank you for all you do for my children. I am looking forward to an incredible year at Regents Academy!